At least, that is what my wise-woman self tells me. The process is not linear. The process will not be understood by your monkey mind (which undoubtedly will want to dictate the process and will fail miserably). The process may be met with all your defenses. The sudden need to sleep. The sudden need to hide into a book. The sudden need to shove mouthfuls of popcorn into your mouth while reading said book. If your body says rest, rest. If you body says dig in, dig in. If your body says, “you are putting up your defenses” then stay curious. Allow your partner to call you out (they always will). Allow your dreams to speak to you (make sure you’re listening). Walk, relax, meditate in savasana. Self-care, self-care, self-care. And then some more. The sun will rise again. It didn’t disappear, it was just out of view. Relax into the orbit of your life. Which teacher will you choose? “The night comes and we give ourselves permission to dissolve into the rest of darkness. We let go of all the valleys and rivers we wish to cross and our dreams for some distant future.” -Sarah Blondin, Live Awake. Tonight I stretched out on the living room couch in the dark, earbuds in my ears and ready to listen to a guided meditation. 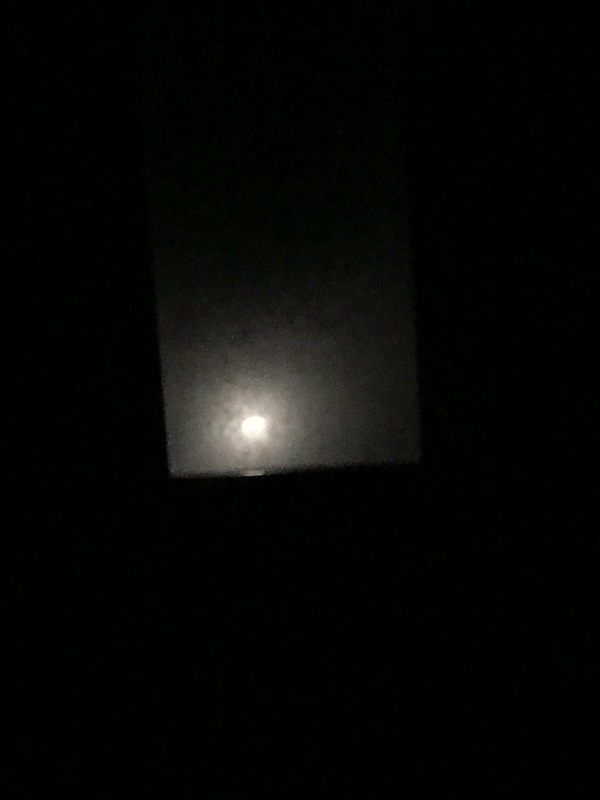 I looked up, there was the moon peaking through our skylight. I meditated bathed in moonlight. I was brought to tears by a deeply moving meditation about learning to surrender. It was just what my soul needed.